Health workers are the most valuable assets of the health system as it is a labor-intensive service industry. There is, however, a continuing shortage of health personnel in the public health services in India which could undermine the country's efforts to fulfill the Millennium Development Goals. Health Policy and Planning has been shaped by the recommendations of various expert committees set up by the Government from time to time. These committees recognized the importance of human resources in health (HRH) and made important recommendations. This paper attempts to comprehensively review the evolution of policies and strategies for the development of HRH in India. 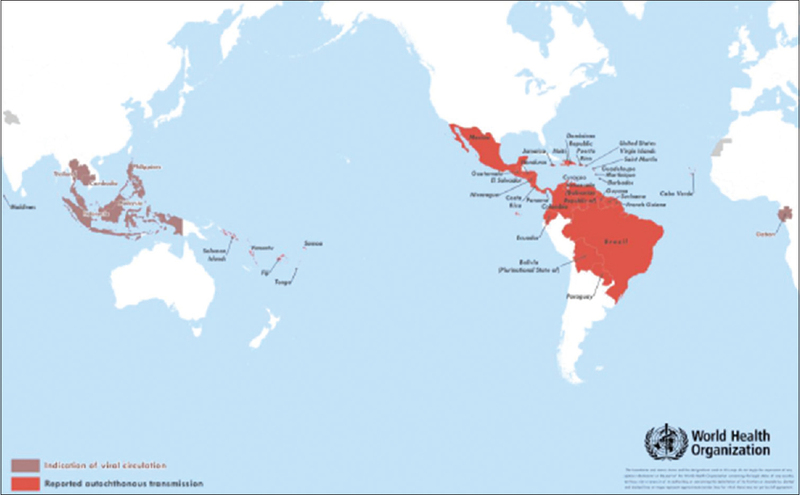 Zika virus is responsible for causing Zika virus disease (ZVD), is another vector borne disease which is being linked to the sudden rise of microcephaly in few states of United States of America and the cases of Guillain-Barré syndrome in French Polynesia. Looking at the cases and the relation between congenital malformations found in children of women who were suffering from ZVD, it has been declared as public health emergency of international concern by World Health Organization in February 2016 and now it has become important local public threat with impending pandemicity. Case fatality though is not very high but number of suffering individuals crossed 5 lakh alone in Brazil and still increasing. 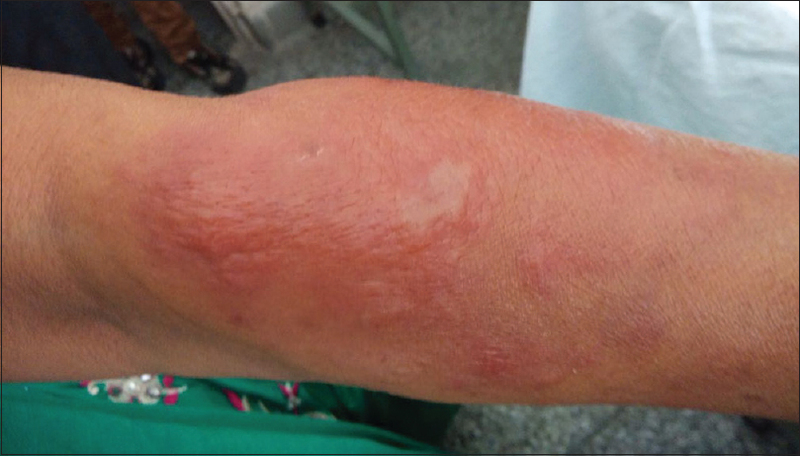 The symptoms are similar to Dengue virus disease or Chikungunya virus disease. 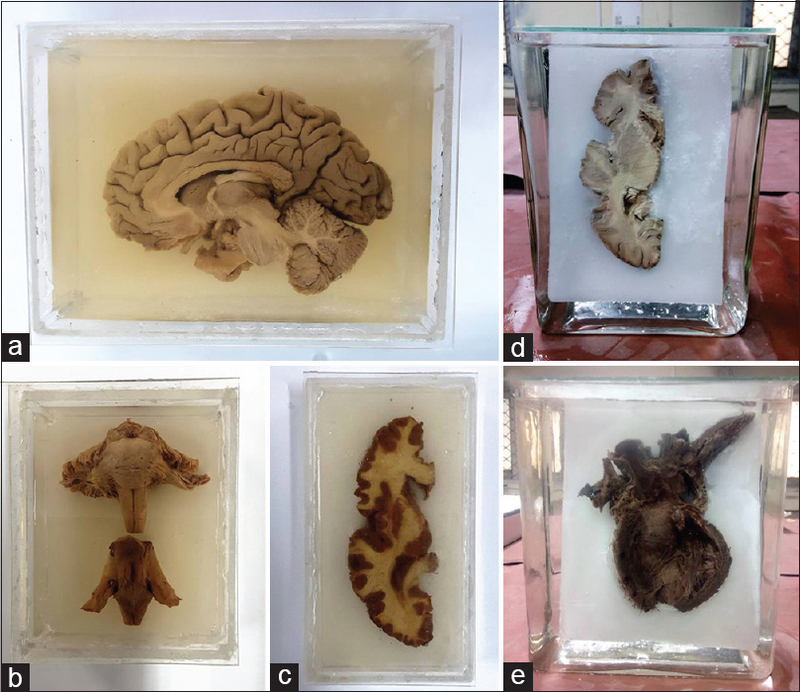 Introduction: Anatomy museum specimens are used as a visual undergraduate teaching aid, which are gradually replacing cadaveric teaching as nowadays human cadavers are becoming difficult to obtain. Materials and Methods: Paraffin wax was used for mounting anatomical specimens to replace age-old methods of using plaster of Paris and glass sheets. Results and Conclusion: Wax mounting of specimens resulted in better understanding of anatomical details and relations of structures. This technique is easy to use, inexpensive, and reproducible. Objective: Although extensive use of antimicrobial medicines (AMMs) has been reported in India, there are limited data on AMM use and expenditure incurred on the same among inpatients. This study was conducted to determine (i) the pattern of AMM prescribed, (ii) adherence of AMM used with the hospital essential medicine list (EML), and (iii) expenditure incurred on AMM. 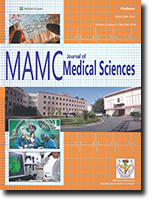 Materials and Methods: An observational, prospective study was conducted among inpatients in Medicine and Surgery Departments of a tertiary care teaching hospital in New Delhi, India, who were receiving AMM. AMM use characteristics (name, dose, dosage form, frequency, duration, route) and expenditure incurred and ABC analysis was done. Results: AMMs were prescribed to 60.1% of patients. Of these, the indication for prescribing AMM was therapeutic in 76.1% patients. 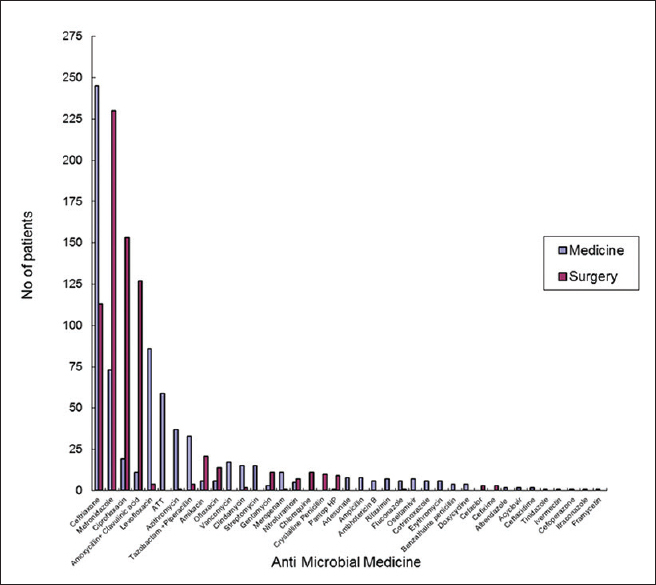 On an average, 2.52 antimicrobials were prescribed per patient. The most common route of antimicrobial administration was parenteral (71.9%). Biological samples were sent for bacterial culture sensitivity testing only in 21.1% cases, of which 23.6% were positive. A total of 46 different antimicrobials were prescribed. The most commonly prescribed AMMs were ceftriaxone, metronidazole, ciprofloxacin, amoxicillin-clavulanic acid, and levofloxacin. The number of AMMs prescribed from EML was 1125 (74.4%). Expenditure on antimicrobials accounted for 52% of the total expenditure on medicines. ABC analysis revealed that the maximum expenditure (72%) was on medicines used in a small (9.82%) percentage of patients. The parenteral use of newer, more expensive antimicrobials, not included in the hospital EML, accounted for a large proportion of expenditure on antimicrobials. Conclusion: There is an urgent need to develop a hospital antimicrobial policy, guidelines for use, and generate awareness among physicians to improve and rationalize the economy of antimicrobial use in the hospital. Medical professionals are often unsure of the course of action in medico-legal cases. Thus they are rather reluctant to attend to cases of accident for fear of being involved in unnecessary litigation later on. Even in cases of serious accidents, medical professionals hesitate to offer help, sometimes resulting in patient's death. This paper highlights some important legal precautions to be taken care of in cases of road side vehicular accidents. These simple steps, if observed by medical practitioners, will prevent unnecessary litigation. Adrenal myelolipoma is an unusual, benign, and biochemically inactive tumor that is composed of mature adipose and hematopoietic tissue. The presence of mature bone spicules within the lesion is extremely rare. Very limited number of cases of myelolipoma containing bone tissue has been reported in the world literature. 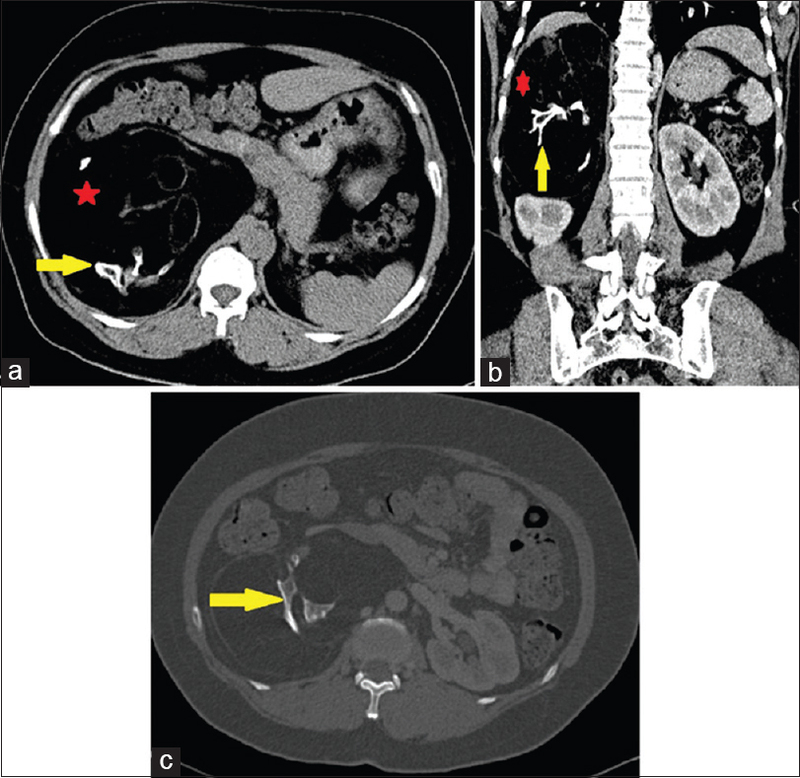 We report a rare case of giant adrenal myelolipoma containing mature bone tissue. 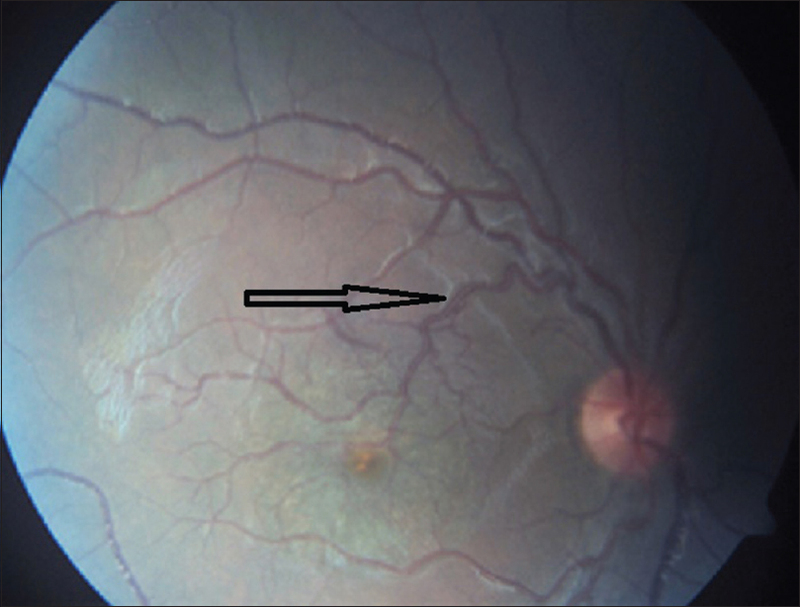 Congenital retinal macrovessel (CRM) is a rare developmental condition in which a large vein, artery, or occasionally an artery and a vein together, cross the macular region. Most often, this aberrant vessel originates from a branch of the inferotemporal vein, with branches crossing the horizontal raphe. CRMs do not affect vision unless there are associated foveolar cysts, foveal ectopia, pigmentary changes at fovea, macular hemorrhage, exudates, serous macular detachment, or the macrovessel crosses the fovea. We present a case of a 13-year-old male patient with congenital macular artery crossing the fovea, associated with macular edema and decreased visual acuity. In this case report, we highlight the fundus fluorescein angiography findings and optical coherence tomography evaluation of the patient. Sweet's syndrome is a disease of unknown etiology characterized by eruption of painful, erythematous, cutaneous plaques, and nodules of rapid onset accompanied by fever, leukocytosis, and neutrophilia. 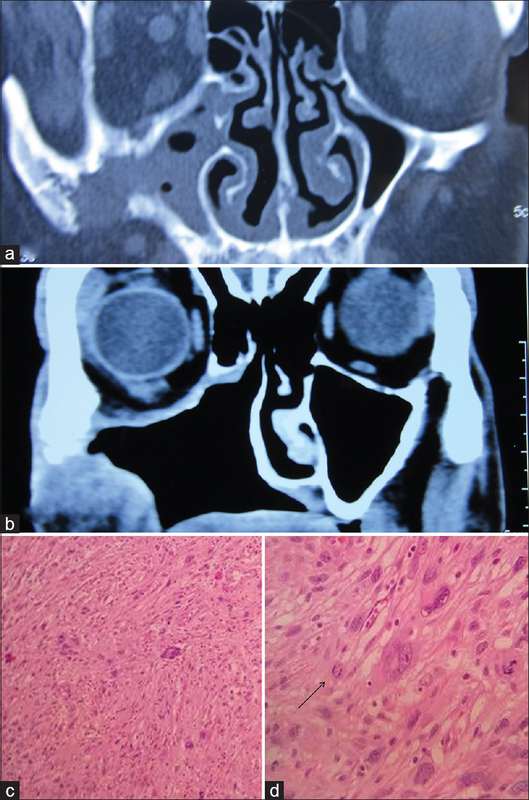 We report a case of a 52-year-old female having Sweet's syndrome with nodular scleritis. 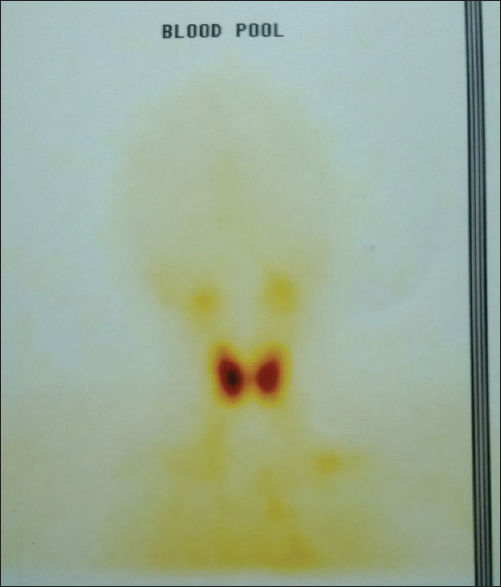 Incidence of second primary malignancies is on the rise, especially in head and neck region because of increased longevity of the patients and availability of better diagnostic tools. We illustrate two such cases along with their treatment modalities. One of the patients developed malignant fibrous histiocytoma of maxilla as second malignancy which in itself is a very rare malignancy with only six cases reported in the literature so far. Duodenal ulcer perforation is uncommon in children which is why it is not usually considered in the differential diagnosis of acute abdomen in them. In this brief report, we are presenting a case of successfully managed perforated duodenal ulcer in a child. 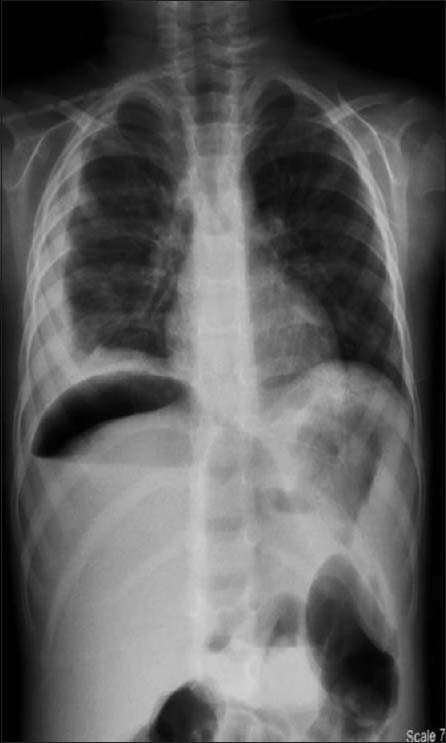 Another interesting point was the presence of air only under right hemidiaphragm, a sign generally known to be associated with duodenal perforation. 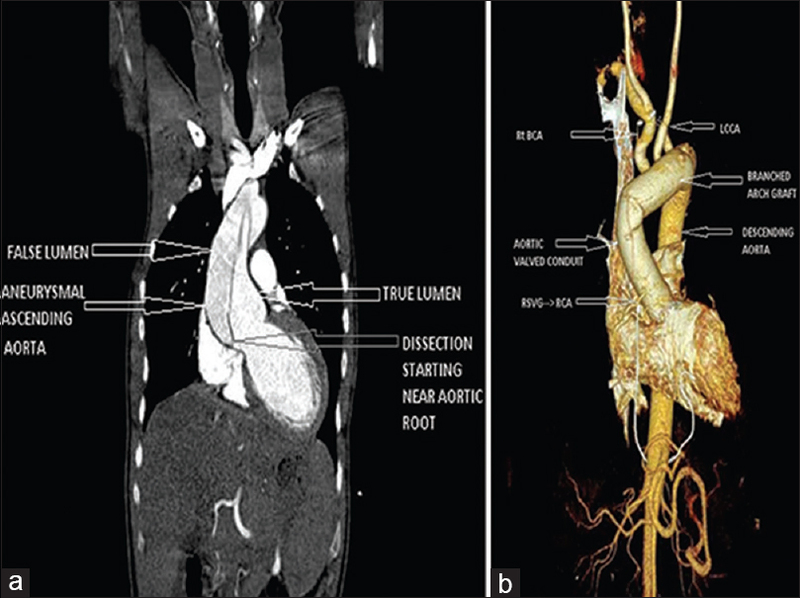 We report the images of a case of a 31-year-old male presented with acute Type A aortic dissection with severe aortic regurgitation involving the arch vessels. He was taken up for surgery on cardiopulmonary bypass (femoro-axillary-bicaval). Bentall-De Bono procedure with mechanical aortic valved conduit and total arch replacement with woven polyester branched graft under hypothermic circulatory arrest plus selective antegrade cerebral perfusion was performed. Reversed saphenous venous graft to proximal right coronary artery grafting was also performed.